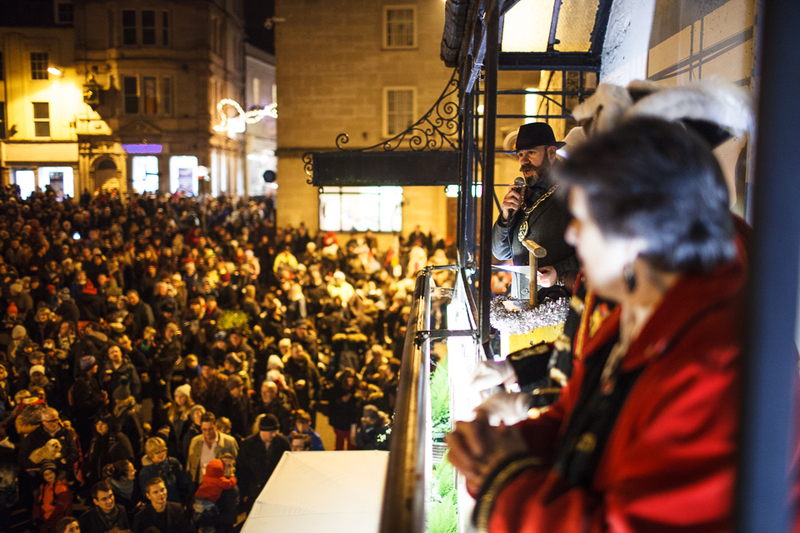 Frome’s yearly Christmas celebrations are always popular and a great treat to kick off the season. The event in the town centre features a lantern procession, carols, festive food stalls and of course the lights switch-on. In 2017 the evening started with lantern processions through the town town centre from 5pm, with lights switched on from The George balcony at 6:45pm. See the 2017 Christmas Lights Switch On event page for more details, or visit our gallery. Frome has found many different ways to bring the festive spirit to this event in previous years: 2013 saw Jensen Button burn up the town’s streets in his F1 car – watch the video here or see images in our gallery; The 2014 event brought an Edwardian Christmas to Frome by transforming the town centre into a vintage fairground; and in 2015 the theme of “Snow Ball” featured projections from local artists, illustrators, photographers and school children throughout Frome. 2016 saw a much more traditional Switch On event, with the focus placed on family, friendship and togetherness. 2017 will expanded on these themes. Watch this page for more information on the Christmas event to follow. The celebrations bring many opportunities for gift shopping. Shops stay open late during the festivities, and the Christmas Extravaganza market at the Cheese and Grain is the perfect place to find gifts for friends and family. Other markets include the Christmas Charity Fair and the Christmas Farmers Market, or there’s always the December Frome Independent. For more ideas on for gifts and treats, look through shopping in Frome and find out about Christmas opening hours. There’s also loads of other festive events in Frome. In 2017 highlights included a performance from Cara Dillon featuring classic Carols, Celtic Hymns and other songs to celebrate and share in the joyful spirit at the Cheese and Grain and The Children’s Festival Christmas Party held on December 17th. The Merlin and the Memorial, Frome’s two theatres also offered a great selection of festive shows. This included a panto of Jack and the Beanstalk and a musical adaptation of Hansel and Gretel. Keep up with our events calendar to see what events December 2018 will bring. 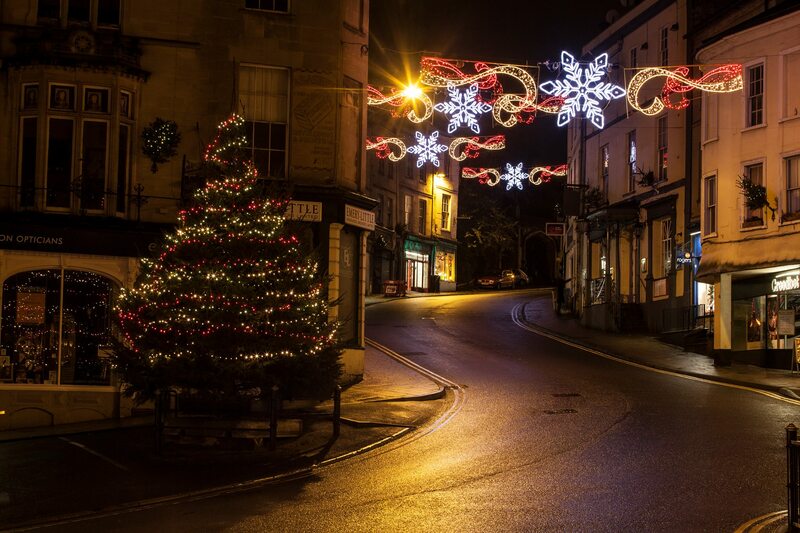 For more ideas, read our Top 10 Christmassy Thing to Do in Frome. Our annual Christmas brochure will also be available at Frome Town Hall or the Discover Frome Information Point before the 2018 Switch On with a full programme for the Christmas Lights Switch On, a calendar of events throughout December and some other festive bits like carols and puzzles.